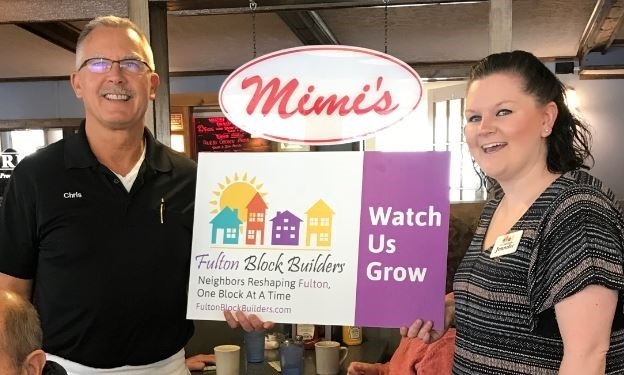 Fulton Block Builder- receives support from many community businesses taking them closer and closer to their fundraising goal. Linda Eagan receives donation from Zach Menter, President and CEO of Oswego County Ambulance Service. 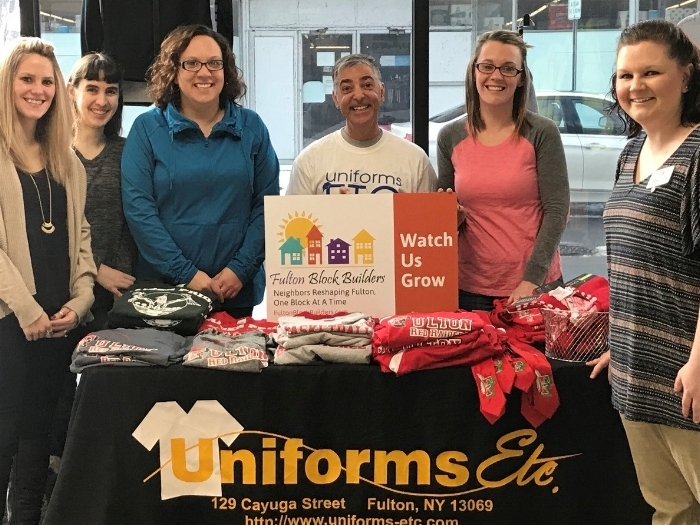 This donation makes Menter a NEIGHBORHOOD PRIDE LEADER as a Fulton Block Builder (FBB) Sponsor. Oswego County Ambulance Service, locally known as Menter Ambulance Service, is a private ambulance service whose main headquarters is in Fulton, NY. Their service provides Advanced Life Support emergency ambulance transport, and non-emergent transportation. Zach said he’s been watching the changes brought about by the Block Builder program and wanted to become involved. Linda thanks Zach for the very generous donation. Every dollar FBB raises is matched 2-to-1 by the Shineman Foundation up to $100,000.00. Jennifer Whalen from FBB is seen here with Chris Sachel after receiving a BLOCK BUILDER donation from Mimi’s Diner. Patrons of Mimi’s will find delicious sandwiches and other American favorites at Mimi's Drive Inn in Fulton. Prices at Mimi's are a bargain, so you'll have plenty of cash left over to treat a friend (or two). Mimi's Drive Inn is a great place to go for lunch or dinner, so make your way over to the restaurant today and munch on an American classic. And let Chris and the gang know how much you appreciate their support of the Fulton Block Builder program! Eryl Christiansen and Regina Lunkenheimer,Eastern Shore Associates pose with Jennifer as she thanks them for becoming the newest FBB RENOVATOR supporter. Eastern Shore is an organization with over 80 insurance professionals operating from 7 branch offices throughout Central and Upstate New York. They work with over 30 insurance companies, giving Them the ability to find the best solution to each of their customers' insurance needs. The employees live and work in the same communities as their customers, and are dedicated to helping protect the homes, automobiles, businesses, and lives of our neighbors. Supporting the FBB project is a natural for Eryl and Regina and the entire Eastern Shore team. Uniforms Etc. team - Michaelanne Vail, Kiyara Moore, Jill Abbott-owner, Patrick Aquaviva and Michaelene Vail are proud their company is a SUPPORTER of FBB. Uniform’s Etc. is a custom embroidery and custom screen printing workshop that takes pride in creating unique embroidered and screen-printed designs for all your apparel and gift item needs. Their custom embroidery and custom screen printing is considered the state of the art in value, quality and service. They even made the FBB name tag Jennifer’s is wearing! If you, your business or your service agency is interested in donating and/or providing discounts to participants, please e-mail FBB at fultonblockbuilders@gmail.com.